In the given circuit the input is an Voltage source which has a value of 10.u(t), where u(t) is the Unity Step Function. The Resistance of the Resistor is 1 Ohm. And, two capacitors of 3F and 2F and connected in series to this Resistor as shown in the figure. Find the voltage across the 2F capacitor as a function of time, V(t). Assume the Capacitors are initially carrying zero charge. So, That was the question and the answer. Before you proceed to solving the question, there are a few things you need to take a look at. Assuming you have the basic knowledge of the above mentioned topics, lets proceed to the solution. We present here two methods of solving this question. You might have used a different method to get the solution. But, as long as you got the same answer your method should be fine. If you think your method is much simpler, share it with us and we'll let others know about it. 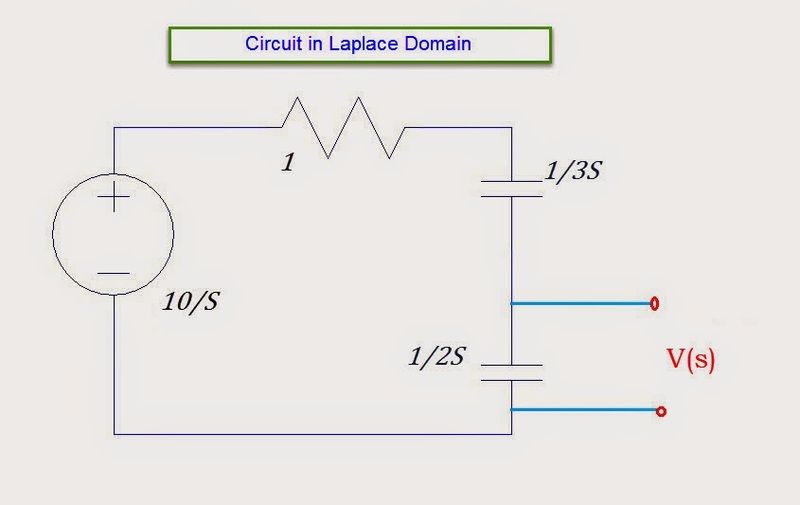 We can easily transform this circuit in to its Laplace Domain Equivalent and it will be very easy to work in that domain. After we got the required quantity in S-domain, we'll take Inverse Laplace Transform of it and we'll have our answer. One we have that , it is easy to get the voltage across the capacitor..
First we'll find the current in the circuit as Total voltage divided with the total Impedance. Now, we have V(s). To find v(t), we just have to take the Inverse Laplace of this, which will be,. So, That's it. That is the answer. Its very simple and it hardly takes 40 secs to complete this. So, That is the first way to get the solution. Now, lets see the second way. 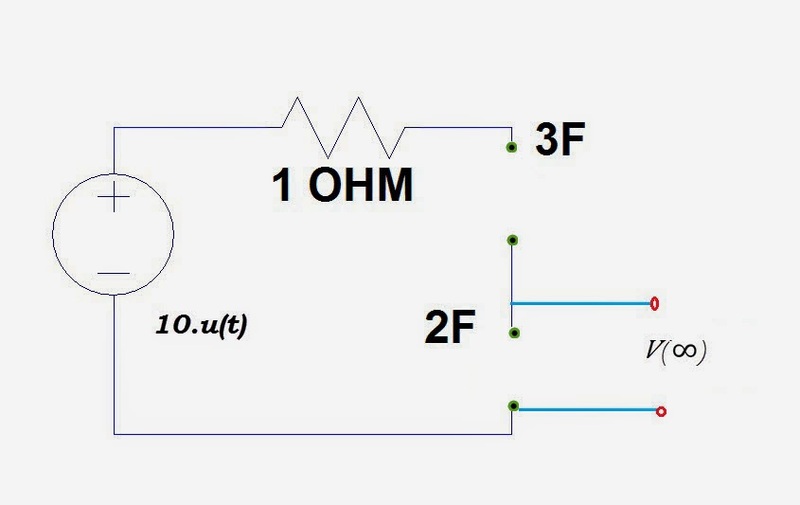 This method is applicable if the circuit is a First-order circuit as the one given in the question is. Now, only thing left out is the time constant. Time constant of a RC circuit is 'RC'. In our case we will take the equivalent capacitance of the two capacitors. So, we now have everything we need. Just substitute them in the above equation and you'll have your value. This method is relatively simple compared to the previous method. You just need to remember the simple formula and that is all there is to it. This should take around 30 secs to solve. So, those are two of the methods in which you can get the answer. If you didn't understand something in the explanation please let us know and we'll help you with that by providing more explanation at that particular point. For more Questions like these, stay tuned to our blog by subscribing for our email notifications. As always have a Happy reading and Good luck with your preparation!